The small board on flying leads is 99% certain a fuel cut defender. Yellow wire goes to PIM input (pressure sensor). I can't see definately from the pictures but it looks like the green goes to where the pin should go in the PCB and I expect the pin has been cut. I can't read the chip number, but from the tracks & components it looks like a dual op-amp acting as a voltage limit set by the pot. Bar Rob, with the blitz ECU's I'm sure its only been the 10u 50v capacitors that any of us have seen fail. My first repair I actually used a cap out of an older st165 ecu, that's still going fine, but no doubt the upper board which didn't show signs of trouble 4 of maybe 5 years ago can't be too far off faillng in my CS ecu. 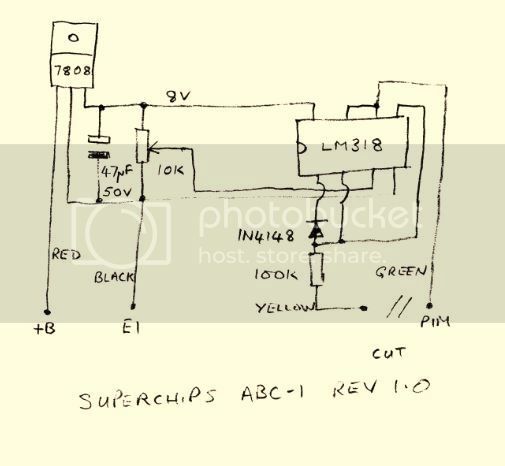 Sorry its a rough diagram of the superchip. I believe you are correct that it is just a fuel cut defender from what i have found out and would have been fitted with a manual boost controller at the same time. A you are correct the pim has been cut. A further update, another CS ECU added to the list, this one is Doris's. I haven't tested whether any tracks have corroded away completely but there are a couple of suspect ones. well thats got to be proof.... a bad batch of cap'sused to build those 5000 ecu's at least. a bad batch of cap'sused to build those 5000 ecu's at least. From what I understand and I am open to correction is that the average sort of life span for a capacitor is 10,000 hours and or roughly 20 years from the data sheets I have read recently when looking for replacments which was what lead me to my eailer statment about probably seeing this problem occur in the ST205 ECU's in time. Also it certainly is not just the CS or RC ECU's that suffer from this I knew of a MR2 Rev 2 turbo that was suffering the same symptons so we had a look inside that ecu at the start of the week and it has the same two capacitors leaking as the CS and RC ecu I have already repaired. As for the cause of this issue I think there could be several factors and these are just thoughts going through my head no hard evidence to support them. 1. Age of the capacitors and being at the end of their life span. Well that blows my heat theory out the window then it must just be 100,000 bad capacitors brought by Nippon lol. Like I said I have now seen x1 CS Ecu, X1 RC ECU and x1 MR2 Rev 2 ECU (all made with in months of each other) all with this issue whats the betting there are a load more cars with this problem that dont even know it yet the missfire on mine was not very pronounced to start with but got worse over time and the more I replaced in the ignition system the more frustrated I got LOL. There's a suspected one on MR2OC at the moment. Swapping ECU cured the problem, just waiting for him to lift the lid and look. To be fair, most of the people / cars I know of that age and still with standard ECU's are CS/RC so the apparent 'CS/RC' problem is likely to be more widespread. I've got stuff I designed 20 years ago and has been running non-stop since then. We are currently doing a life extension refurb on a few systems to give them another 5-10 years. Changing capacitors isn't on the to-do list. To be fair, electrolytics tend to fail after being unpowered for long periods of time, and generally on 'domestic quality' kit such as TV's videos etc. That's not to say that denso buyers weren't trying to save money on every item at the time the ECU's were made. I've heard too many horror stories of non-technical buyers trying to be clever by saving pennies on cheap items. I've heard too many horror stories of non-technical buyers trying to be clever by saving pennies on cheap items. Have experienced this too many times myself. The worst thing is they think they are being clever then us techies have to clean up the consequences...grrr!! I better find my ECu and check it. Any info on lead spacing and cap dims of the standard component CDB? I tend to play with valve amps that suffer early failure of lytics due to heat but I have never seen a track burnt away. Some of the Panasonic Fc or FM caps are rated highly for life/temp for lytics, I suspect space is insufficient for a polyprop? My tumble dryer was recently uprated to an "audio grade" (read as 10x cost for no extra spec) polyprop cap due to failure of existing cap that I assumed to have died a toasty death. The tracks aren't burnt away, but chemically etched. Since it appears the capacitors are just 'decouplers' on the power supply, I suspest the ECU will continue ruuning without issues after capacitor falure - that is until the track(s) have finally been eaten away. This process takes quite a time. With a valve amp, you're likely to find capacitor failure would immediately result in either complete failure, distortion, or increased noise and cause prompt return for repair before any coorosion takes place. Electrolytics tend to have much higher capacitance, usually 1uF up to 100,000uF There is only a small overlap with polyprop or ceramic which tend to go up to about 10uF. Anything over 1uF is normally pretty large physically.